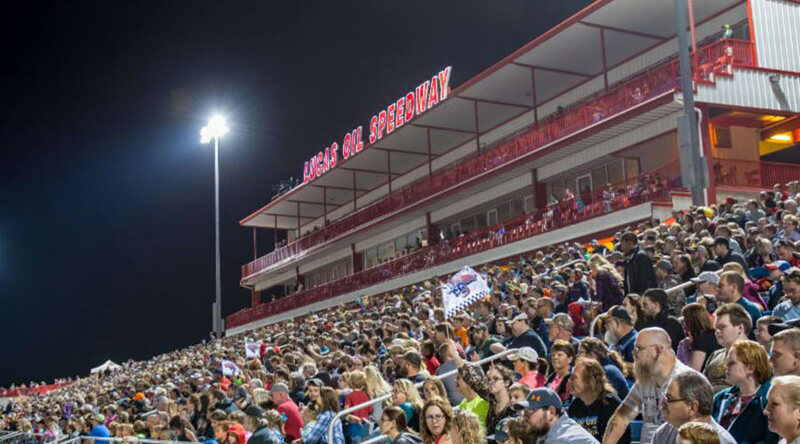 The 27th Annual Lucas Oil Show Me 100 Presented by ProtectTheHarvest.com returns to the Lucas Oil Speedway for 27th running of the event. Scott Bloomquist charged to the win in 2018. Ray Cook captured the inaugural edition of the premier event held at Lucas Oil Speedway in 2010, while Newport, Tennessee's Jimmy Owens, scored the Show-Me 100 wins in 2011, 2012, 2013, and 2016. Martinsville, Indiana's Dean O'Neal won in 2014. Blairsville Georgia's Jonathan Davenport captured the 2015 edition of the event. Bobby Peirce charged to the win in 2017. This is surely one you won't want to miss! This Crown Jewel Event features the Lucas Oil Late Model Dirt Series (LOLMDS) and the Lucas Oil MLRA battleing for 100 laps and a $30,000 to win top prize. 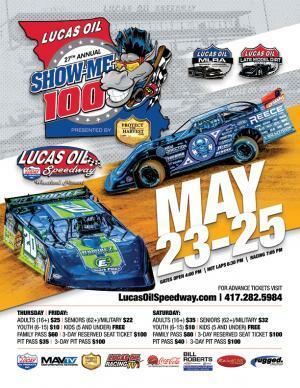 The Show Me 100 Weekend Kicks off with a special $6,000 to win/$600 to start Show on Thursday night dubbed the "Cowboy Classic" in honor of longtime MLRA owner/Promoter Allen "Cowboy" Chancellor plus the Pitts Homes USRA Modifieds will be runninga complete event with $600 going to the winner on Thursday night as drivers race to earn valuable points in to Saturday's main events. Dirt Late Model Hall of Famer Scott Bloomquist captured the win in the inaugural Cowboy Classic in 2014 and returned to victory lane in 2018 while "superman" Johnathan Davenport took top honors in 2015, and 2016. Jacj=ksonville Florida's Earl Pearson took his turn in Victory Lane in 2017. In the event of inclement weather we will post on our website, on our answering machine and on social media prior to the aces. In the event that racing has started, and in the opinion of the track officials, the inclement weather is sufficient to cancel the remainder of the racing events the show will be considered a complete show if we have reached intermission or the heat races are complete. If the halfway point in the program has not been completed, rain checks (tickets to races) will be issued good for an upcoming race. NO REFUNDS will be given. If you purchased a pit pass, your armband is your rain check and your responsibility. We are not responsible for loss or theft of your rain check. If you choose to use your rain check at an event with a higher admission you will have to pay the difference. Any remaining reserved seat tickets not sold as 3-day tickets prior to the event will be available for purchase here as single-day reserved only the day of the event and can be purchased from 8 am until 10 am. Handicapped seating is availiable. 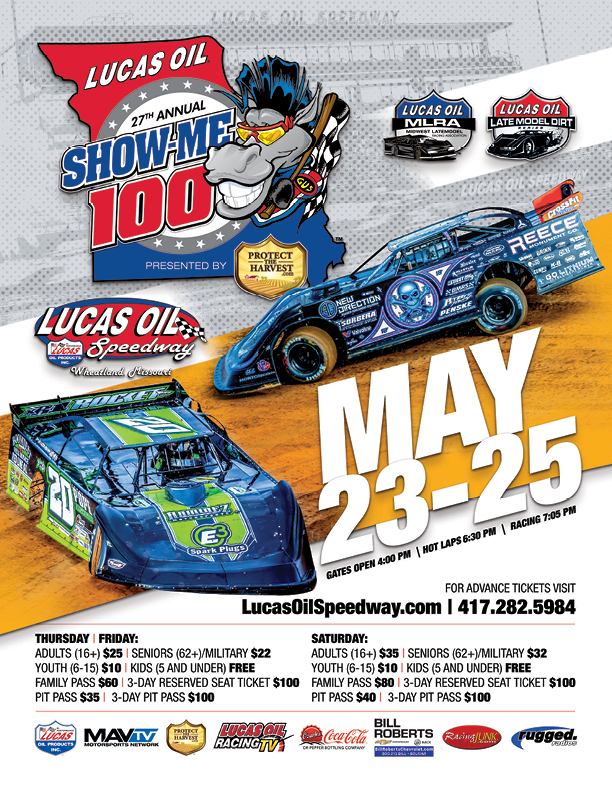 On Saturday night, consolations events will be held for the LOLMDS/MLRA Late Models plus the LOLMDS/MLRA Midwest Sheet Metal Show-Me Challenge will be held for the Late Models prior to the 100 Lap Lucas Oil Show Me 100 taking center stage. The Pitts Homes USRA Modifieds will aslo be in action as Racindirt.com Presents a special $1,200 to win/$150 to start main event with the field set through Thursday and Friday's preliminary qualifying events.